Take a trip down memory lane while waiting for your prescriptions. 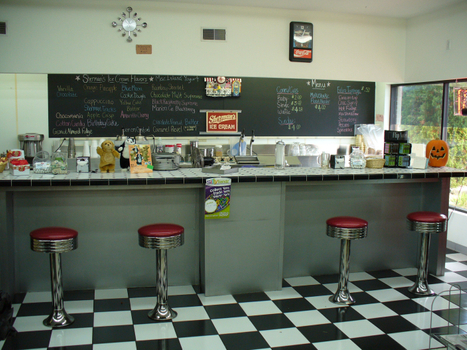 Have a seat at our old-fashioned soda fountain and enjoy a treat, featuring Sherman's Finest ice cream. Westlake Drug & Giftshop is the only pharmacy in the Portage-Kalamazoo area that maintains a working soda fountain. Along with the fountain we also carry a unique line of gifts, including Simply Noelle clothing, Willow Tree, Vera Bradley plus an American Greeting card for every occasion. For over 40 years, Pat has practiced as a pharmacist providing the highest quality patient care at Westlake Drug & Giftshop. He continues to practice as a Pharmacist at least two days per week and facilitates the progressive growth of both the pharmacy and the giftshop. In 2018, Reddy joined Westlake Drug & Giftshop as a Pharmacist. Reddy manages the pharmacy four days a week and spends the other days coordinating ideas to help grow the pharmacy. Reddy has practiced pharmacy since 2008 and enjoys helping out patients by providing them with innovative services such as multi-dose medication packaging and immunizations. Marsha has been involved with the gift department at Westlake Drug & Giftshop since 1990 and continues to arrange a vibrant and evolving selection of the finest and most unique gifts and collectibles. Marsha is available Monday through Friday to assist with any needs arising from the gift department or soda fountain.